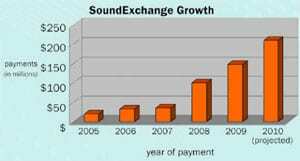 SoundExchange, the non-profit performance rights organization (PRO) that was appointed by the Copyright Royalty Board to collect and distribute statutory performance royalties owed to recording artists and sound recording copyright owners, reports it has distributed almost $88 million to more than 18,300 payees during the Q3 2011. This distribution, the organization’s largest to date was collected from royalties paid by Internet radio, satellite radio, and cable TV music only channels. SoundExchange has seen a dramatic increase in payments to artists and labels since it began, as the accompanying graph shows. In 2010, total distributions were $249.2 million up from $155.5 million in 2009.